If you’re thinking of starting a nonprofit (association, club, charity, etc. ), first of all, congratulations! Secondly, you’ve come to the right place. I created a comprehensive guide that covers absolutely everything you need to know about how to start a nonprofit and what it takes to become successful in today’s world. The rise of the internet and smartphones has actually decreased people’s attention spans, making it harder for nonprofits to stand out and get their message across. Online shopping and same day delivery has made people expect instant gratification from the organizations they interact with (not to mention being able to pay dues, or donate online). Large organizations are using “big data” to deliver extremely personalized experiences to large groups of people, meaning they can now fulfill the roles small organizations used to play. It’s important to understand how these changes will affect your nonprofit, because the failure rate of new nonprofits is high. Plus with over 1.5 million established nonprofits in the US, you could be facing some tough competition. While this may sound worrisome, I’ve seen many new nonprofits meet these modern-day challenges and gather hundreds of members and thousands in donations very quickly. In this comprehensive guide, I’ll share some of their stories and show you how to start a nonprofit that can succeed in today’s world just like them. I will also cover everything else you need to know, like how to register for tax exempt status, hire your first staff, build your website, and attract your first paying members. By following this guide, I believe you’ll stand the best chance of success with your new nonprofit. In simple terms, a nonprofit organization takes any profits it receives from goods, services, donations, or sponsorships, and cycles them back into the organization to further achieve its mission. Nonprofits commonly serve communities (clubs, associations, or chambers of commerce, etc. ), or are organized around social causes (humanitarian aid, disease research, education funding, etc.). In contrast, for-profit businesses distribute profits to the shareholders and investors of the organization. While starting a nonprofit is a worthy cause, any ambitious individual can quickly become overwhelmed by all the rules and regulations. Before you jump in, consider this list of the advantages and disadvantages of starting a nonprofit to make sure you’re ready for what’s ahead. Highly Motivated Employees: Research shows that nonprofit employees are highly motivated by intrinsic rewards like achievements of their clients and a good work/life balance, rather than pay. This means you can expect to attract employees who care about your nonprofit’s purpose and want to help you make a difference in the world. Time and Money: Starting a nonprofit is likely to take months of preparation and devoted work. It can also cost up to $800 just to submit your application to the IRS. Depending on your bandwidth and knowledge, you may need to hire a consultant to make sure you’re filing everything correctly. Public Scrutiny: Anyone may request copies of any nonprofit’s filings and review their expenditures, salaries, and income. If your nonprofit will have a large public facing, you can expect some scrutiny over how you handle administrative expenses. There are always articles about overpaid nonprofit CEOs being published. Just take a look at this image that showed up in my Facebook feed and received hundreds of comments (whether true or not). No Profits: No individuals or shareholders can receive profits from your nonprofit. This can make it more difficult to generate interest from potential investors. Volunteer Board Members: Volunteer Board Members can be a pro and a con. From a con perspective, sometimes it may be had to activate your volunteer board to contribute to achieving goals. 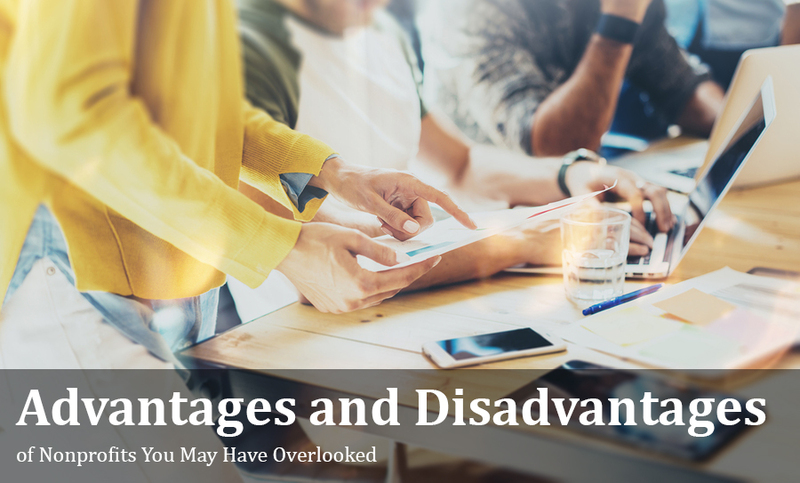 If these advantages and disadvantages are inline with your expectations of starting a nonprofit, the next section will cover everything a new nonprofit needs to be successful. 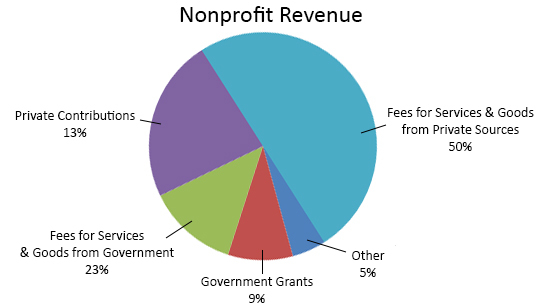 How Do You Form a Nonprofit in the USA? "I wish I knew that before I started.” These are words you never want to say. Unfortunately nearly half of all nonprofits are setup to fail from the start, because they don’t put enough time into research and planning. Do you have proof that your nonprofit will fill an unmet need in your community? Gathering support, receiving grants, and getting donations will become a whole lot easier if you have strong numbers to back up your idea. For example, if you want to start a tennis club, you’ll need to have a good estimate of how many tennis players live in the region that don’t have anywhere else to play. Are there any other organizations already serving the same need you plan to? Even if your nonprofit is targeting a very niche need, there may be another organization already servicing that need. As I mentioned in the intro, Large organizations are using “big data” to deliver extremely personalized experiences to large groups of people, meaning they can now fulfill the roles that small organizations used to play. For example, if you wanted to start a children’s illustrators association, you may have competition from a children’s writers association, many of which also service children’s illustrators. The National Council of Nonprofits offers a locator tool to find nonprofit organizations in your area and throughout the United States. What sort of people will join or support your organization? Gaining support for your nonprofit quickly is one of the most crucial steps in building a successful organization. That’s why knowing exactly who your targeted demographic is can make it easier for you to find supporters and members, and create resources they’re interested in. One good tool to help you research demographic information is the American Fact Finder. Once you’ve answered these three questions, you’ll have a clear idea of how to give your nonprofit the best chance at success. Now it’s time to use what you’ve learned to build a plan to give your nonprofit a lasting foundation. After you're able to explain the necessity of your new nonprofit, it's time to build a strong foundation, and the strongest foundations start with the founder. If you're the founder... that's you! Self-Discipline: As Brian says best, "If you can discipline yourself to do what you should do, whether you feel like it or not, your success is virtually guaranteed." Integrity: All successful organizations are built on trust. People will be more willing to work with you and support you if they can trust you, especially during difficult times. "Be perfectly honest in everything you do and in every transaction and activity," Brian says. "Never compromise your integrity." Persistence: If you are able to develop a habit of persistence even before you meet obstacles, they will be much easier to get through once you meet them. "The courage to persist in the face of adversity and disappointment is the one quality that, more than anything, will guarantee your success." A Clear Sense of Direction: In Brian's experience, he's seen motivated entrepreneurs get hijacked by the day-to-day tasks and short term problems that naturally arise from starting an organization. That's why Brian says to develop a clear sense of direction, not only for your own work, but for the people who work with you. Decisive and Action Oriented: Successful founders must think and make decisions quickly. Seek feedback just as quickly and self-correct when needed. Brian says, "The key to triumph is for you to try. Successful people are decisive and they try far more things than other people do." If you can instill in yourself a strong tie to each of these traits, and live them out in practice, you'll have built the strong foundation your nonprofit needs to succeed in today's world. The next step to start a nonprofit is to develop a clear plan on how your organization will operate. The mistake many founders make in the beginning stages is that they skip ahead to incorporating their nonprofit without spending the time to create a business plan. And while a “business plan” may sound like it only applies to “for-profit” organizations, nothing could be further from the truth. As you’ll quickly discover, potential investors, donors, and board members will all ask to see copies of your business plan, and if you don’t have one, you’ll miss out on a lot of opportunities. Executive Summary: This is a short overview of your business plan. When writing yours, think of it as an elevator pitch. Products and Services: Here you fill out the type of value will you be creating and what makes it unique. Besides membership and events, many nonprofits offer additional merchandise like t-shirts to help bring in some extra money (revenue will be covered in the next step). For example, the New York Association of School Psychologists offers travel mugs, jewelry, books and apparel to help raise more money. Market Analysis: In this area, you will explain what the market landscape looks like: your competitors, your stakeholders, and a SWOT analysis (Strengths, Weaknesses, Opportunities, Threats) on why your organization will succeed. What supplies and equipment will you need? What kind of staff or volunteers will you need? 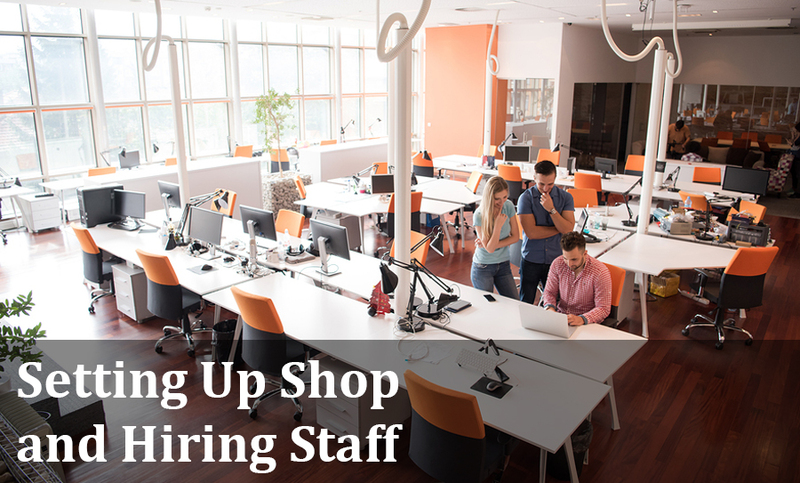 Organizational Structure: This is the place to list out your staff, their roles, and how they’re organized. Talk about what expertise each role will have and how your organizational structure can make your nonprofit successful. To create a simple organizational chart, here’s an easy tool called Organimi that can help. Financial Plan: This is the page any potential investor will flip to before deciding to support your organization. It will also help you apply for grants and loans. To create yours you will need some knowledge of basic accounting principles to project cash flow analysis and budget. If you need help, The Wallace Foundation has some excellent resources and calculators to get you started. Another part of your financial plan is how you plan on generating revenue for your organization. I cover this in full in the next step. Many organizations have difficulty building their business plan, but it can be easier by using the example templates I provided. 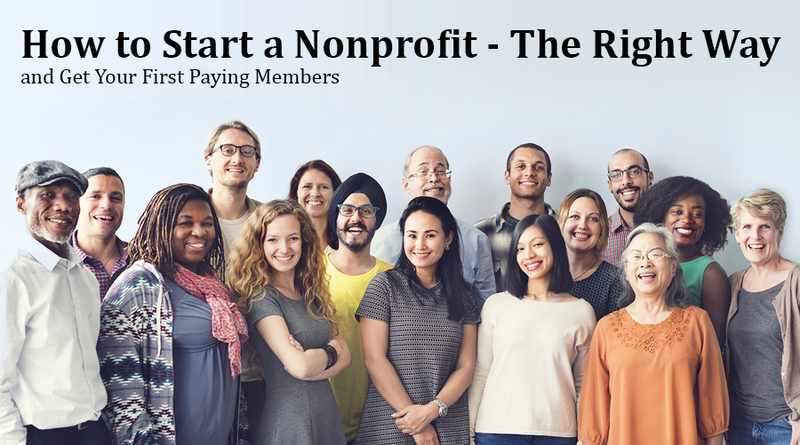 In the next section on how to start a nonprofit I’ll cover the four main sources of revenue for nonprofits and how to create the best strategy for each. Note: I will not be covering this as it only applies to nonprofits that provide services on behalf of the government, like healthcare, or public education. In the below graph, you can see the average proportions of each revenue source. No nonprofit I’ve come across has figured out how to do all four exceptionally well. While some do well with donations, others do better with grants, etc. But, what I have seen work best when approaching all four at once is to have separate strategies for each different revenue source. Below I’ll cover the basics of each revenue source and how to develop a strategy for your nonprofit. Revenue from goods and services include money made from membership dues, event tickets, professional services, and products like merchandise. For example, the writing association I'm a member of charges a yearly membership fee, event ticket fees, fees for professional editing, and they sell t-shirts. The two biggest contributors in this form of revenue are from membership dues and event tickets, which I cover below. Nothing engages and attracts members greater than the desire to belong to a community who shares their personal interests. And among the most popular ways to build a community of like-minded individuals is through networking events. In fact, here’s an example of an association who grew over 1,000 members just by attracting new people to network at their annual conference. People join communities and access resources, because they create value. Unfortunately, creating value is one of the biggest struggles of new nonprofits. “Why aren’t people coming to my events? Why aren’t people asking to use our services?” These are questions I hear all the time. The reason is because holding the right types of events and creating the right types of resources take a lot of understanding and hard work. You need to know who exactly to attract and what exactly they’re looking for. Surprisingly, this is actually where the for-profit world can lend a hand. For-profit businesses don’t have grants, donations, and dues to rely on for revenue, so they must figure out how to create enough value with their products and services to generate profit. The only way to understand what drives your members is to talk directly to member prospects and find out what kind of information, events, and services they would be willing to pay for. Having a clear and concise value proposition is the easiest way to interest a prospective member in your organization. As Wordstream explains, “A value proposition tells prospects why they should do business with you rather than your competitors, and makes the benefits of your products or services crystal clear from the outset.” Or, in nonprofit terms — “Why should someone become a member and what promise are you offering them in return.” But, a successful value proposition is more than just words, it’s the look and feel of your brand, your website, your services, your events, and how you treat members. Take for instance the Apple iPhone. Wordsteam suggests that the Apple iPhone experience IS the product. Anyone who owns an iPhone can tell you how simple the interface is, how beautiful the design is, and how easy (and addicting) it is to use. In the same way, what value proposition are you offering prospective members that will want them to join your organization? Imagine you’re a tennis club. What makes you stand out from the other tennis club down the street. When a prospective member visits your tennis club, what’s the impression of the courts, equipment, change rooms, etc.? Who would join your organization? What is their age and gender? What are their interests? What is their income level? Where do these people live? Where do they hang out? Where do they get their news from? Once you have your Target Market identified, you’ll have a much better idea about what products and services to offer and how to advertise them to these people. 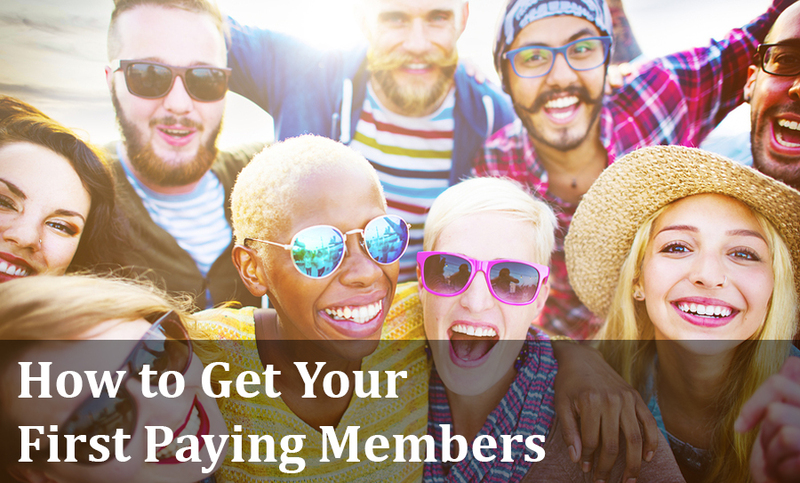 The price you charge members to join your organization is called a member due. Member dues are often paid on a monthly or yearly basis, and quite often nonprofits make their member dues renew automatically monthly after month or year after year until a member cancels their membership (this saves a lot of time in administration). A win for your members that keeps member dues low. A win for your organization that covers as many administrative costs as possible through member dues. In the above example, $25,000 is certainly not enough to run an entire organization and pay staff. 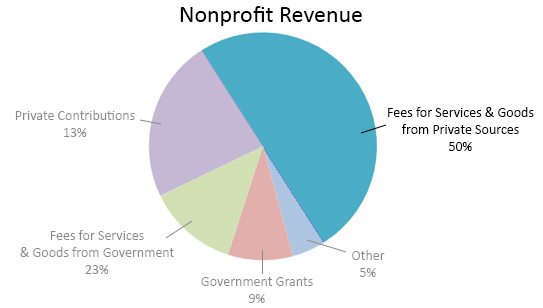 That’s where event fees, donations, grants, and products and services also contribute. But before you jump to other sources of revenue, there’s one more step to ensure you build a robust member-due driven revenue stream. Which do you expect to be more valuable to your organization in the long run? The answer is definitely one retained member. That’s because the costs with finding and convincing a new member to join your organization can be up to 25 times more expensive than keeping a current member engaged. So, when creating value to attract members, consider how you will retain them in the long run. As time goes by, you may have to refresh your strategy to keep up with the times. To help you out, here are 12 practical ways to engage and retain member in today’s world. I know a Lawyer’s Association that runs completely off event fees without charging membership dues. That’s because they’ve created a regular schedule of amazing events that sell out every time. However, this isn’t the case with most organizations who use events as a tool to supplement their revenue, and to attract new members. How much you rely on events for revenue depends on what type of organization you’re starting (a tennis club, vs a foundation would have drastically different event revenue). However, to help you see what most nonprofits do when it comes to events, I analyzed over 1,000,000 events created by Wild Apricot’s nonprofit customers. You can view the full details of what I call The Ultimate Nonprofit Event Calendar here. If you plan on making paid events a major source of revenue for your organization, here is a full guide on how to plan an event and a fantastic event planning checklist that you can print off and use. Private contributions are made in the form of donations. But, before you can accept donations, or engage in fundraising activities, many states require you to complete Charitable Solicitation Registration. You can do this in tandem with incorporating your nonprofit. Some states even require you to register for “Games of Chance” like raffles and 50/50 draws, whereas in other states, these activities are actually illegal. To find out your State’s regulations, and to register, select your State from this map. The Nonprofit Council has also put together a great article on Ethical Fundraising to help guide you when it comes to soliciting donations. 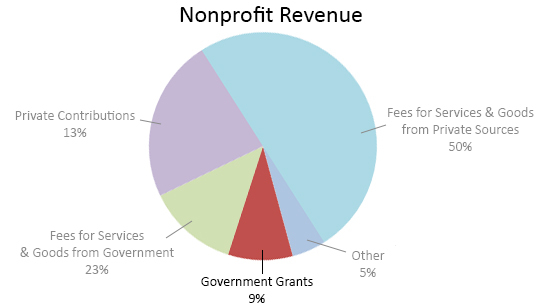 To reduce personal income tax, many people contribute to nonprofit organizations. However, people won’t give to your organization unless they believe in your cause and can see you doing good work. Once you’re ready, try some of these 18 ways pro nonprofits are collecting donations from individuals. Fundraisers are the simplest tactic to increase revenue. That's because they utilize the people who already believe in your organization to reach new people through fun events and campaigns. Even the smallest nonprofits are able to quickly raise thousands with some simple fundraising tactics. Take for example the story of one woman who raised $8,000 for her football club in just one month by shooting a video and having her club members email it out to their friends. Fundraisers are also often best paired with events. If you want to raise money by holding a fundraising event, you’ll want to read this. A study of 99 nonprofits discovered that fun runs are the most cost effective, easiest to plan, and have the highest fundraising potential of all other types of fundraising events. We also have a list of 200+ fundraising ideas to help you find the right one for you. If you need more help, The Fundraising Authority has a great guide on fundraising for beginners, or consider hiring a fundraising consultant. Sponsorships can be the toughest type of private contribution to seek. Some organizations have a whole team setup just to seek out sponsors and maintain relationships. But if you're just starting out, there’s only one activity you need to do that has the highest chance of landing a corporate sponsor. According to sponsorship expert, Chris Baylis, that one thing is a discovery call. The reason discovery calls win over all other tactics (including creating the dreaded sponsorship package) is because you can qualify a potential sponsor on the spot and begin a relationship right away with those interested. If you’re new to grant applications, beware! The words “grant application deadline” have been known to cause panic in the nonprofit world, as this comic indicates. Filling out a government grant correctly, within wordcount, and on time can be a very stressful task. My best advice here is to know what grants you can apply for and start the application far in advance. I’ve heard way too many stories of computers crashing the night the application is due. The Puffin Foundation is a private fund for individuals and foundations. To help you get started with an application, the United States Government has a great guide on how to determine your eligibility, application instructions, and even how to avoid grant scams. Or, if you enjoy webinars, Charity How To has a free webinar on how to write your first grant. Building a business plan and creating your revenue strategies from scratch is not a lot of fun, but the payoff is definitely worth it. Once you’ve completed all these steps, it’s finally time to do the one thing most are itching to do from the start: pick a name. Typically the best nonprofit names are easy to remember, indicative of what they do, and sound appealing. Our members are...? If your nonprofit has a specific type of member then it may be important to include them in your name. Doctors without Borders and Mothers Against Drunk Driving are good examples of this. Once you’ve picked a name, you’re not done yet. Make sure another organization doesn’t have the same name as you by conducting a quick Google search. Then you’ll need to check if it’s available with the Secretary of State in your State. Here is a map with links to each Secretary of State where you can check. Once you have a business plan and a name, there’s one more step before being incorporated. That is to gather your board. Some States will require you to gather your board before incorporating, because you must list their names in the documents. If your State doesn’t require this, it’s still a good idea to recruit your board first, because they can help you with the incorporation process and lead your new nonprofit on the best path when faced with challenges at the start. In this section, I will cover how to recruit the best board members for your nonprofit and the five steps to get them up to speed as quick as possible. An unsupportive and unmotivated board can quickly dismantle a nonprofit. Unfortunately this isn’t a rare occurrence and I’ve heard many stories of office drama, board members scrapping the mission, and even forcing staff to carry out their own initiatives. If you’re worried about this happening to you, here are 14 interview tips to help you uncover a toxic board member from the start. On the other hand, a supportive and motivated board can help your nonprofit grow quickly. It’s all about finding the right fit during the hiring process. But what is the “right fit” exactly? One-third from individuals who have access to financial resources or soliciting donations. One-third from individuals with management expertise in areas of financial, marketing, legal and the like. One-third from individuals connected at the community level, with expertise in your service field. If you recruit a team who possess the right experience, skills, and characteristics, there’s a good chance you’ll build a strong team that will make your nonprofit a success. To help you recruit such a team, I’ve broken down the whole recruitment process with into four steps, including templates to follow and places to find board members. Before you can begin your recruitment process, you’ll need to determine which roles you need filled. This is where you can refer back to the organizational structure you created in your business plan. Leader: This person is the key representative who can lead the nonprofit and act as a spokesperson. The role title might be: President, CEO, Board Chair, etc. If you’re creating this nonprofit, this role is likely yours. Sometimes boards have a second in command to the Leader, typically called the Vice Chair. Success for the Leader might be to grow the organization a certain percentage year over year, develop a strong culture within the nonprofit and build up the brand of the nonprofit as a professional organization within the community. Secretary or Committee Chair: This role is responsible for helping the Leader execute projects, write meeting minutes, keep track of office activities, help organize meetings, make sure the board complies with all local bylaws, etc. Success for the Secretary might be to organize all meetings on time, facilitate discussion between board members and make sure all board members are informed and on track. Treasurer: This person is responsible for keeping track of money, fees, expenses, paying bills, etc. Success for the Treasurer might be to stay within budget and file all tax forms on time. This is also a good time to note that board members are typical not paid, and are often expected to contribute financially to the organization. When writing up your job description, it is a good idea to mention this. If you do decide to pay your board members more than $600 a year, you must issue them an IRS Form 1099 Msc. Another important note is that your organization will need bylaws, which all board members must follow when carrying out their duties. Your bylaws will establish procedures for the affairs of your organization (operations, elections, conflicts of interest, etc.). To help you get started drafting your own bylaws, consider this helpful template with examples. Once you have full job descriptions, it’s time to find the best candidates. Most new nonprofits looks for candidates from their personal connections — colleagues partners, or volunteers, as these people already have access to their community and are in line with their mission and values. However, a word of caution when approaching family and personal friends as often emotional matters can take precedence over business goals. Once you have a short-list of potential applicants, the next step is to interview these people to determine the right fit. Before you begin interviewing, develop a standard set of questions to ask all candidates. This will help you objectively evaluate each against the other. Fundraising is a significant obligation of board service (state give/get clearly). Can you tell us about your experience in fundraising? Board members bring experience, wisdom, strategic thinking, and their rolodexes. Can you tell us about yours? When you conduct the interview, don’t do it alone. Gather a small committee of people whose judgement you trust to help you make the right decision. Once you’ve selected your board members, have them sign a Board Member Contract to officiate their role. Here’s a great Board Member Contract template you can use. The next step to ensure success is to give your board members the training and tools to let them hit the ground running. A comprehensive orientation program will do just that. Every smooth transition into a new role starts and depends on orientation. One-on-one orientation. This should be done by the founder, or CEO. Include a tour, meeting of the rest of the board and reviewing of the board contract. Match them with a board buddy. At the beginning, everyone will feel like the new kid on the block. Board buddies can help your new members get up to speed faster and eliminate feelings of intimidation from insecurity. Plus, one of the most common reasons people become board members is so they can network and socialize. Provide them with your orientation guide. These are the materials you created in your guide. Since your board members are volunteers, take-home materials will allow them to get up to speed in their spare time. Host a welcome reception. This is a great way for everyone to get to know each other, including staff, donors, volunteers, and community leaders. A well oriented board is one of the best ways to ensure success of your new nonprofit. Once you’ve completed the above steps, it’s time to finally incorporate your nonprofit. Decide on a legal structure: Choose whether your organization will be a trust, corporation, or association. Apply for nonprofit federal and state tax exemptions: A nonprofit organization may be eligible for exemption from federal income tax. The IRS provides guidance and instructions on applying for tax-exempt status, but I cover more of this in the next step. Obtain necessary licenses and permits: Does your nonprofit have all the licenses and permits needed to comply with federal, state, and local rules? One of the main benefits of incorporating a nonprofit is tax-exempt status. This means that your organization does not pay any tax to the IRS. If your nonprofit identifies with one of the above, or another type of organization, you can view the whole list here. In order to receive tax-exemption, you will need to register with the IRS as your appropriate 501(c) organization. Here is the link to apply for 501(c)(3) status on the IRS website. If you need help, you can phone the IRS Tax Exempt and Government Entities Hotline. The final step is to receive tax-exempt status for your nonprofit is to register with your state. This is usually accomplished through the state tax commission, but the IRS State Links for Exemption page will help you find the correct office, filing procedures and annual reporting requirements in every state. 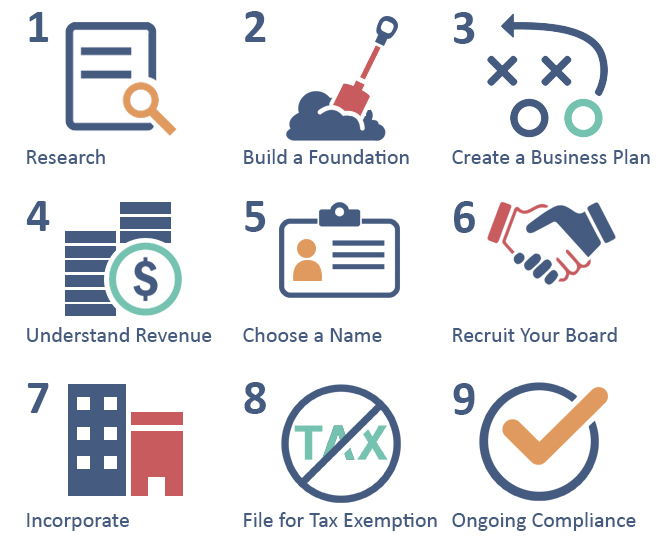 By following these steps on how to start a nonprofit, you'll have all your bases covered and be in a top-notch position for staying in compliance with both federal and state regulations. You can also check out this guide to filling out a 990 form for your nonprofit and helping your nonprofit remain tax exempt for more help. Once you’ve successfully incorporated your nonprofit, there are a number of things you must do every year to keep your tax-exempt status. The first thing you must do is file a 990 Form. This form collects information regarding your revenue, expenses, board members, achievements, and other operational information. However, which form you fill out depends on your gross receipts. This is also a good time to note that before you can accept donations, or engage in fundraising activities, many states require you to complete Charitable Solicitation Registration. You can do this at the same time as incorporation. Now that you’ve completed all the legalities of starting your nonprofit, it’s time to set up shop. In this section, I'll cover how to set up your office (marketing collateral, furniture, equipment, etc.) on a dime and which staff most new nonprofits hire first. While designing the look of your organization can be fun, don’t spend a single cent on business cards, banners, t-shirts, or any other marketing collateral until you’re fully incorporated and are ready to start getting members, sponsors, and donors. I know of a nonprofit startup that went broke from purchasing marketing collateral before they even got incorporated. However, once your organization is setup and ready to go, arming your staff, board, and volunteers with business cards, t-shirts, and other materials can be a great way to help spread the word about your organization. If you've already got a logo design in mind, but don't have the design skills, there are a number of places that offer inexpensive design. If you don't have a logo in mind yet, I suggest browsing this list of the 75 best nonprofit logos to get some ideas. So, when you’re ready, here are some easy ways to get great-quality designs and materials printed (cheaply). The cheapest way to get a good logo is to head on over to Fiverr, where you can purchase a custom-designed logo for $5 or more. Simply select what type of logo design you’d like and then select your budget and Fiverr will introduce you to a number of designers willing to design within your budget (If you need more information on setting up your brand identity, Logaster has put together a full guide on how to do this). If you’ve got more of a budget (~$300), you can create a logo design competition for your nonprofit over on 99designs, where designers will compete to create the best logo for you. In order to get a good competition going, here’s a great guide to getting started. You can also use Fiverr and 99designs to design any other graphical content you need like business cards, or t-shirts. With a budget of just $100, you can get a logo, 100 business cards, a few t-shirts and a banner for your organization to setup right away. Of course you’ll need to have everything shipped somewhere, so in the next section on how to start a nonprofit I’ll show you how to get your nonprofit an address for $50. The writing association I'm a member of has nearly two thousand members and operates entirely from a single desk in a shared office space. The only other fixtures are a phone, and a filing cabinet. For member meetings, they rent a room (for free) at a local library. I also know of another association, CALL, which operates entirely out of volunteers’ homes. While not as glamorous as a large office complete with cubicles, meeting rooms, and a reception area, these nonprofits have been very resourceful with what they have. The reason they’re able to do this is because most of their activities are run using software entirely over the internet. I'll tell you what type of software that is in an upcoming section. Depending on what types of services you offer, you may not need a physical office space, which can save you a lot of money. And even if you do, there are a number of organizations that rent office space at a discount to nonprofits and will even donate furniture and computer equipment. No Office: If you choose to run your nonprofit without a physical office, you will still likely need a PO Box to accept mail. This can cost anywhere from $50 per year to a $1,000 depending on your location and the size you need. Here are instructions on how to rent a PO Box. Whether you choose to rent out space, or operate out of home, you will still need furniture and computer equipment. Luckily there are also a number of organizations that donate essentials to nonprofits. Below are a number of organizations that donate free or discounted furniture or computer equipment to nonprofits. Once you have your new office space organized and your computer up and running, next, you will determine if you can run your entire nonprofit yourself, or whether you will need to hire staff. Many small nonprofits start with only one part-time or full time staff until they reach a point where they need extra help to grow larger. The writing association I'm part of has a few thousand members across the country, but only one part-time staff. That’s because most of the association’s value is offered through online resources, and once-a-month meetings for members in the headquarters’ city. The board is also very active in the association and many members volunteer to help see to other operations (myself included). If you’re unsure of how many staff you will need, the best thing to do is reach out to another nonprofit of a similar size and consult them. The other determining factor on whether or not you’ll need a staff is how your nonprofit will operate. Below I’ve listed some common nonprofit staff roles and what type of organizations they’re typically found in. Membership Manager / Administrator: If your nonprofit will gather members (like in a club, association, or society), this role is crucial for maintaining member records, developing member recruitment strategies, and engaging/retaining members. Communications Manager / Administrator: If your nonprofit will greatly rely on social media campaigns, public relations (PR) activities, public speaking events, and member and volunteer management, then consider hiring someone to fill this role. Fundraising Manager: If your nonprofit relies primarily on government grants, public fundraisers, or corporate sponsors (like a charity or foundation), you may consider hiring someone who specializes in raising money. Events Manager: If your nonprofit will coordinate large monthly events, yearly conferences, and other types of events like a speaker series, or educational workshops, then an Events Manager is a must. Even if the above positions don’t apply to your nonprofit, you should still consider hiring a general administrator either full time or part time. Just like the story of Kari Kehr, who had to shut down her new nonprofit after just a year, the failure of many new nonprofits is that they can’t find the time to do everything themselves. Decide what types of benefits you can offer employees. Here is a full overview of benefits you may offer for your staff. Create a formalized performance review process. Here is a free template you can use. One last tip is to take your time. Many nonprofits are anxious to find someone right away, only to wish they had spent more time finding the right person down the road. My advice is to start the recruitment process early, and don’t settle for something that’s “good enough”. Your new nonprofit needs the best chance at success it can get, so you need someone who will be a rockstar. 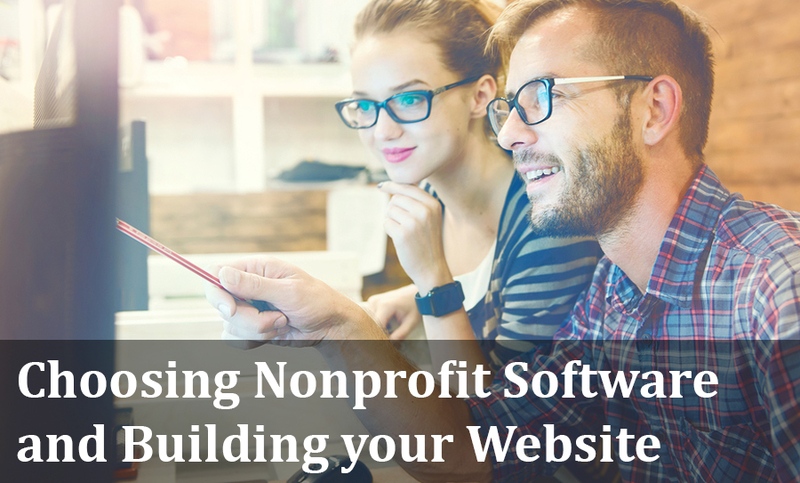 In this section on how to start a nonprofit I'm going to cover how to choose the right software for your organization and everything you need to know about building a complete nonprofit website that will grow your organization for you. Most nonprofits reach a tipping point with the way their organization operates within their first few years — the systems and processes they originally set up don’t scale as the organization grows. Unfortunately, if you’re unable to make a drastic switch in how your organization operates, you may be closing your doors. This happened to one nonprofit I know of, a Lawyer’s Association. At the time, the organization had reached about 300 members, but as they continued to grow, so did the administrative work (processing payments, coordinating events, data management, etc.). Unfortunately they didn't have the budget to hire any new staff, so the current admin found himself overworked to the point that events became half planned, the monthly newsletter was dropped, and no one was seeking out new sponsors. Fortunately, the association was able to break out of the conundrum they were in, and they're now growing well (currently past 700 members). How did they do it? Using software. In the next section on how to start a nonprofit, I’ll cover why nonprofits choose one option over the other. In this option, nonprofits choose separate softwares to run separate administrative functions. For example, they get a finance software to help with finances, an event software to help process registrations and payments, and an email software to send out newsletters, etc. If you’re considering using multiple software programs to manage your nonprofit, here are some of the advantages and disadvantages of doing so, along with two types of nonprofits that typically take this route. Freedom to choose or switch software whenever you like. Many softwares offer a free version for low-usage customers. Only use and pay for what you need. You will have to learn how to use and teach others how to use multiple systems. No integration between platforms, so you will have to copy and paste data between systems. May end up more expensive in the long run as each software will require pay upgrades as you use them more. In this scenario, the staff at the nonprofit will start off completing all processes by hand. 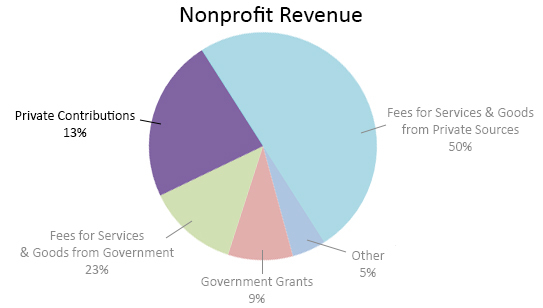 As the nonprofit’s budget grows, so does the amount of software they are able to purchase. If you’ve got a “techie” on hand, they likely have the expertise and sometimes a preference to learn multiple systems. Some techies even like to write their own code to help automate tasks like scheduled email reminders. If you do have a techie on hand, one thing to consider is a transition plan in case that person leaves your organization. I’ve heard a few stories where a nonprofit is left high and dry after no one in the organization knew how to take over the highly-customized processes setup by a past techie. Gmail gives you basic email service. Once you grow past 100 members, you may find that Gmail becomes more trouble than it’s worth to send customized messages to large groups of people and you may consider upgrading your service to another email provider like MailChimp (paid). This is a comprehensive online donation processing software. Word offers document writing and editing on the cloud. You will need a Live account to use Microsoft Word Online. Another option is to use Google Docs for a more basic platform. Excel is great for building a basic contact database and financial management. You can also use Google Sheets for a more basic platform. However, once you grow past 250 members, Excel and Sheets will become more trouble than they’re worth (even though they’re free) and you may want to explore membership management software. One of the most popular options for online event management. An easy way to do all of your basic accounting and financial management. Wordpress is the most popular choice for website management. They also have a number of plugins for online membership forms and other functions. A basic online system for collecting member dues, donations, and event payments. One word of caution: if you choose to go with multiple software options,t be sure to evaluate the total cost of all the different systems you use. As your nonprofit grows in membership and transactions, you may be required to upgrade your payment plan for each individual software. Option 2: All-in-one Nonprofit Software - "Membership Management Software"
All-in-one nonprofit software is called membership software, association management software, or membership management software. Just to be upfront, Wild Apricot is a provider of membership management software (the most popular too!). We regularly help new nonprofits attract, engage, and retain members in order to grow. Create and manage a contact database including members, donors, and sponsors. Here are some advantages and disadvantages that come with using an all-in-one system. Integration between functions (the events module integrates with the database module, etc.) means that you save time and don't have to switch back and forth between systems. Lower costs in the long run as you’re only paying for one system. You also only have to learn one system. The software is setup for nonprofits to hit the ground running and caters specifically to nonprofit needs. It’s hard to get highly customized, advanced functionality if your nonprofit has very specific needs. It’s hard to switch software providers since all your data is stored in one database. It doesn’t integrate well with other softwares if you do choose to buy other software. As your contacts, members, and transactions increase, so does the cost of membership management software. Be sure you’re comfortable with the pricing structure of the software you choose. If you’d like to get a good feel for what membership management software might cost you, I encourage you to check out Wild Apricot’s pricing structure. Many nonprofits who choose membership management software still prefer to build their website on Wordpress, or send their emails through MailChimp. It all depends on your preferences. If you choose to do this, research whether the membership management software provider you go with offers integration with that software. Wild Apricot for instance integrates with Wordpress and Quickbooks. Some providers offer free support, while others offer paid support. Most nonprofits need some help setting up their database and membership levels at the start with their chosen provider. If you are very tech-savvy, you may not care about needing support, but if not, be aware of how much support might cost you. Wild Apricot offers free, unlimited support. Some providers charge setup fees, while others don’t have setup fees. Be sure you know if your software does before choosing. Wild Apricot does not charge setup fees, and even has Coaches who can help you get setup right away for free. Some systems are more complex than others. Before you choose your software, see if you can give it a test drive. Wild Apricot offers a 30 day free trial to help you get comfortable with how the system works before you upgrade. Whichever you choose — multiple software, or membership management software, there’s no doubt that software can drastically change the output of your organization. In fact, here’s the story of how one nonprofit tripled their members by using membership management software. If you are thinking of using membership management software, there are some options for free. Here’s a great list of options from membership software analysis site Capterra (we’re at the top since you can use a limited version of Wild Apricot completely free). Once you have your new nonprofit software setup. The next step is to start creating a presence for your organization to start attracting members. The best and easiest way to do that is to start with your website. In the next section on how to start a nonprofit I’ll cover how to get your website to grow your organization for you and what fundamentals you’ll need to include for it to be complete. I joined the writing association I’m part of without ever speaking to anyone from that organization. I simply typed “local writing association” into Google and clicked one of the first results. About fifteen minutes later, I had paid for a yearly membership. Just like my writing association, setting up a website with a good understanding of what potential members and donors want can help you grow quickly by attracting members right from the internet. To know where their donations are going. Research shows the number two thing potential donors need before making a donation is to feel comfortable about where their donation is going. Including explicit information on the breakdown of what happens to a donation can help increase donations. The last thing every online donor wants is similar to what members want — an easy way to donate. Nothing is more frustrating than multiple steps, downloadable forms, or complicated processes. A simple donation button, or form with instant online payments is best. If you’re looking for tips to make your own donation page, I’ve written a full guide here. In the next section on how to start a nonprofit, I'll cover the rest of the pages your website needs to be complete. Now that you have an understanding of what people want, the next thing to do is to build out your website. Think of this page as a one-page pitch to get someone to join your organization or donate (so include buttons to join or donate). Besides that, many nonprofits include recent news, featured members, upcoming events, and lots of pictures. This is where your mission, vision, history, staff, and general information about your nonprofit goes. Here is a great example of a Join Us page from the Kapolei Chamber of Commerce. This page has all the information about what a potential donor needs to know before donating to your organization as well as the online form to donate. Here's a complete guide on how to build this page out. Here’s an example of a great donation page from Rotary. The best way to make this page is to simply host a calendar of upcoming events where people can register. It’s also a good idea to list some benefits of joining one of your organization's events. Here is an example of a simple event calendar from the Wayne County Chamber of Commerce. If part of the value your organization creates is from publishing resources, this is the place to host them. This is where you give restricted access to resources intended for members only. While these are the most common pages for nonprofit websites (and most websites admittedly), whatever pages you decide to publish, having an organized structure will allow website visitors to find information faster, and can even boost your search engine optimization results. Here are some more tips on how to organize your website. For more tips and details, visit Air-Rallies.org. Once your website is setup, you’ll have a base to start building your online presence and attracting new members and donors. The next step on how to start a nonprofit is to setup your social media channels to increase your organization's awareness. Below is a screenshot of the Google results when I searched “Livestrong Foundation”. 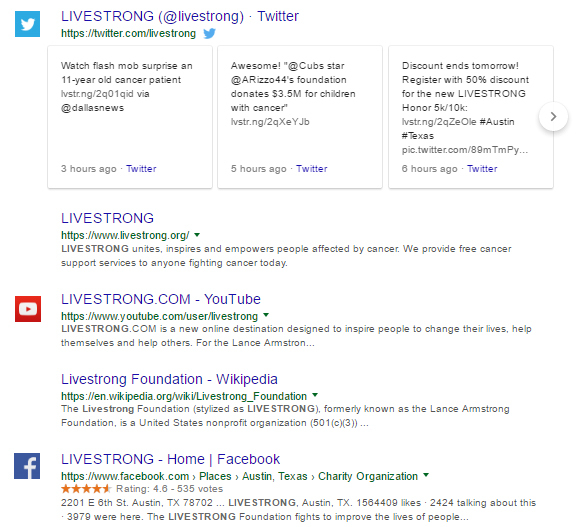 Notice how many of the top results are actually Livestrong’s social media profiles? That's because Google treats social media profiles with high importance when determining what to show in their rankings. If you take the time to setup social media profiles for your organization, you’ll be able to see the same result, which can instantly increase awareness of your nonprofit on Google when you’re first starting out. On top of this, the rise of the internet and smartphones has actually decreased people’s attention spans, making it harder for nonprofits to stand out and get their your message across. This means that your organization must have multiple presences across different social media channels. People check Facebook 14 times a day, and if you’re organization doesn’t come up in their feed, they’re not going to think of you. There are three social media platforms that I recommend you setup first for your nonprofit: Facebook, Twitter, and Linkedin. These social media platforms are some of the biggest and also relatively easy to setup and maintain. Here are three step-by-step guides to help you create your social profiles. Once your social profiles are setup and your website is ready to go, it’s finally time to start attracting members. And while completing all of that is a lot of hard work, going through the process of trying to attract your first paying members will put your nonprofit through the gauntlet. This is the real test to see if your organization will create enough value in your community. So, if I asked you to recruit 100 members for your organization by the end of the month, would you be able to do it? But, I know many new nonprofits who have gained a hundred members or more in under a month with a little creativity and a good understanding of their target market. While I definitely recommend planning out a full marketing strategy and budget to attract new members, in the early days you won’t have a good understanding of which tactics will or will not work so you’ll need to get creative, try new things, and move on quickly when something isn’t working. Take for example, Sarah Rintamaki, the Founder of Connecting for Kids faced a similar challenge. When her son was diagnosed with a rare genetic disorder, she started a nonprofit to support the educational and emotional needs of other parents like her. At first, Sarah tried and tested a number of tactics to attract members, and some of them worked alright, but she stumbled upon one tactic above all others got the attention of every parent in the city. And the best part was it cost virtually nothing. Sarah spoke with the principals of every public school in her region, and got permission to send informational flyers home in the backpacks of every child. It seemed to work right away and in just three years, her flyer strategy had been crucial to gaining 700 new members for her organization. This spike in new members also led to revenue growth from just $14,000 a year to over $100,000 a year. Just like Sarah, it’s important to brainstorm, get creative, and try new things quickly. To help you get the wheels turning, here are a number of tactics that nonprofits often find successful in attracting new members to their organizations. Email everyone you know and ask them to become a member, and ask them to pass the message on to all their contacts. Host an open house networking event and invite everyone you know. Publish industry resources online and drive website visitors to them through blog posts, emails, social media, speaking events, and news publications. In fact, this is the strategy used by a growing nonprofit run by Dr. Samuel Dryer. Every year he publishes an industry salary survey which people must become members to access. In just four years, this tactic grew his organization from 12 members to over 500. Connect with similar organizations in different cities to ask how they attract new members. Work with a Public Relations agency to get into local newspapers, radio stations, and breakfast television shows. Join established communities where your target market is (like Facebook or LinkedIn Groups, Meetups, or similar events) and notify them there. Leaving informational bookmarks at your local library’s check-out desk. Placing coloured stickers on new members’ watches to remind them to tell their friends about your organization. Sending care-packages to your local radio hosts to get them to mention your organization on the radio. If you’re still stumped on where to start, here are 100 more ideas from ClubRunner. Whatever tactics you start with, the most important thing to remember is to adjust quickly. As soon as you are able to get even one member to join, interview them to discover where they found out about you and what was their main reason for joining. Then do more of those activities that attracted them in the first place. One of the biggest complaints I hear from new members of nonprofits is the organization they joined doesn't care about them. This happened to me. I joined two writing associations at the same time. One got in touch with me right away, gave me a tour of their website, and invited me to an upcoming event. The second, a much smaller association, took two weeks before their first response. They didn't give me a tour, they didn't invite me to any events. They expected me to find everything I needed on my own. I ended up cancelling my membership with the second organization, because I didn't feel like they cared if I was part of their organization. The problem is that some nonprofits can't keep up with engaging current members and giving new members the personal connection needed to build a lasting relationship. This is where larger organizations are stepping in. They're building relationships with new members by using software that aggregates data to deliver personalized experiences to every member. So, if your nonprofit doesn't create a great first impression with every new member right away, another organization could be stealing them away. Fortunately, it's fairly simple to do this too with what's called an onboarding process. An onboarding process, sometimes called a welcome stream, is a series of personalized touch-points (most nonprofits use email and welcome kits) that welcome a new member to your nonprofit and direct them to helpful resources, events, and contacts at your organization. The ability to personalize an onboarding process and further communications at scale (even to thousands of members) is how large organizations build loyalty with their members. To keep up with them, you must do the same. The easiest way to setup a new member onboarding is through a series of automated emails that get sent out as soon as a new member registers online. Most email software or membership management software can do this with the ability to personalize each message automatically. Thank your new member for joining. Positively reinforce their decision to join by talking about the amazing benefits of your organization. Point them to useful resources on your website. Include a personal touch from the Founder, President, or another key contact in your organization. Give them the contact information of someone they can get in touch with if they need to. Invite them to look at your online event calendar and register for an upcoming event. If you’d like an example of a great first welcome email, here’s the one that we actually use at WIld Apricot for every new customer we get. After your onboarding emails are sent, make sure to follow up with new members by email or phone to make sure they’re happy about their decision to join and they’re finding everything they need. It’s your initial impression with every new member that will set the mood for the rest of their experience with your organization. If you set a great first impression with a robust onboarding process, you can be sure they'll stay members for a long time. I detail this out in the video below. If you’ve gone through every section in this guide, I'd like to personally thank you for taking the time to read it and congratulate you on your decision to start a nonprofit. While the road to starting a nonprofit and gaining members is difficult, you’ll quickly discover how supportive the nonprofit community is. If you haven't done so already, I recommend joining a community of other nonprofit professionals who can share their tips, insights and strategies to help you grow. We’ve created such a group filled with thousands of other nonprofit professionals, called the Wild Apricot Membership Tribe. You can find us on Facebook and it’s completely free to join. “People plan and God laughs,” says Anne Desrosiers, founder of The World Is Your Oyster (TWIYO), a student development nonprofit. She devoted two full years to planning everything perfectly: incorporating, gathering her board, establishing partnerships and raising funds. She even got a Masters in Nonprofit Management. Everything seemed ready to go, but, on the day of her launch not a single student showed up. Anne discovered what many others who start a nonprofit do: unpredictable challenges can derail even the most careful of plans. Network and never stop sharing the good, bad, and ugly. During the next year Anne cultivated a network of supporters who introduced her to the opportunities that eventually led to the success of her nonprofit. Now, six years later TWIYO is still going strong, building up student leaders in Brooklyn New York. Even with a robust plan in place, just like Anne discovered, the next best thing you can do to make your nonprofit a success is to build a network of support around you (don't forget to join our Wild Apricot Membership Tribe on Facebook). I hope this comprehensive guide has given you all the understanding, tools, and resources to start a nonprofit and become successful in today’s world. Best of luck! Thanks Mr. Ibele for this great resource! I will bring it to my non-profit board and try to use some of your tips and tricks. Your ongoing compliance section left out a key detail. Even if gross receipts are within a qualifying range of a 990-N, if the nonprofit's total asset value is high enough, a 990-EZ or Long Form would be required. You also didn't touch on charitable solicitations registration, which is a registration/renewal requirement over 40 states. Without filing charitable solicitations, a nonprofit cannot solicit donations within that state, or else it can face penalties. Good points, Justin. Thanks for mentioning. I'll update the 990-N section. I did include a section on Charitable Solicitations under "Private Revenue" explained, but I'll include it in the section to incorporate too. Hi Steve, definitely. Added your blog under additional resources. Thanks. Charitable Solicitations would be a better fit under the "Ongoing Compliance" section, as most states don't allow nonprofit to file until they are already incorporated, or sometimes, not even until they have 501c3 status. It all depends on the state. Justin, good point, and you're right, it does depend State to State. I made the move. P.S. thanks for taking a thorough look!